I didn’t realize when I took this photo that there was a dry macaroni noodle in the shot, the sort of thing I’d usually try to notice and correct, and that remains in the frame partly because we were in a real big hurry to eat these brownies and my making everyone wait while I took photos was, I’ll admit, a little rude. 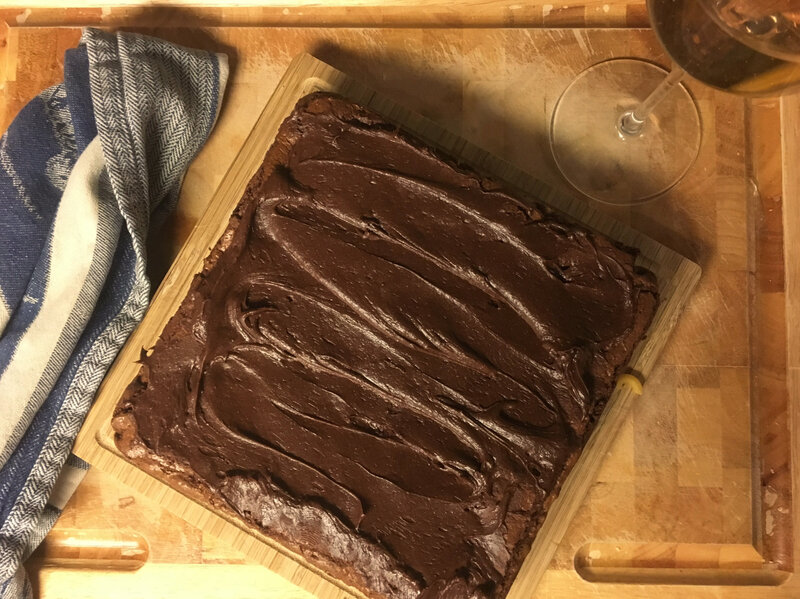 I’ll crop it out for Instagram, but let the record show that these brownies are the kind of thing that inspire a sense of urgency. 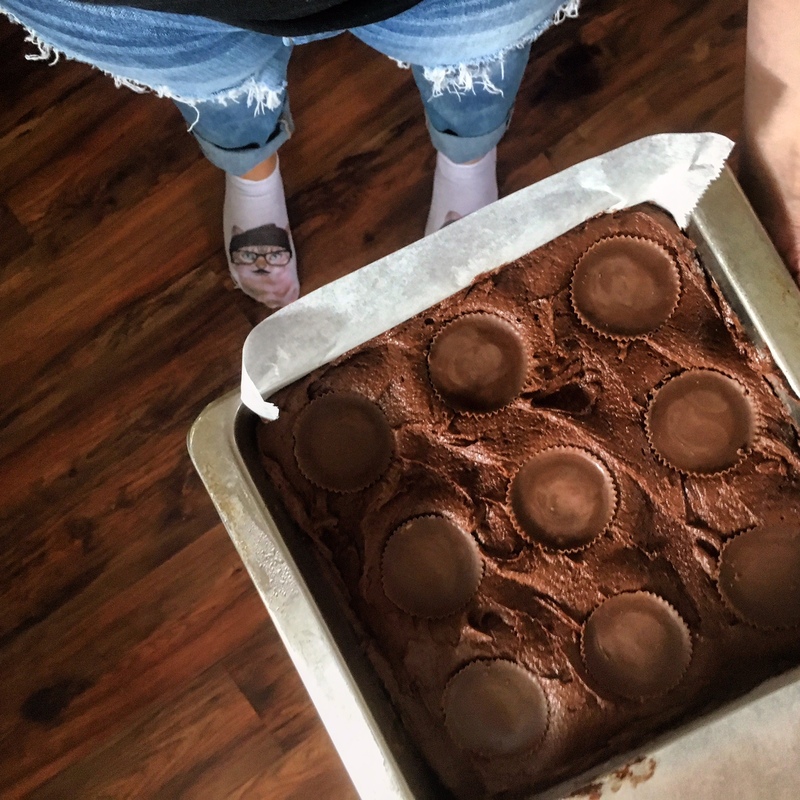 And they are – as I have been told I am so many times – just “a bit much.” They’re show-offs, all fudgy and chewy, with a delicious secret buried beneath a smear of cream cheese frosting – nine whole, perfect Reese’s peanut butter cups. If you’re going to go to the trouble of making dessert for company, it should always be “a bit much,” or why bother? You can eat fruit and yogurt on your own time. Preheat oven to 325°F. Lightly grease an 8″x8″ baking pan, then line it with parchment paper. Using a double boiler, a glass bowl over just-simmering water, or a microwave (three rounds of 30 seconds, stirring each time), gently melt chocolate chips and six tablespoons of butter, stirring occasionally until smooth. Beat the sugar, salt, and one teaspoon of vanilla into the melted chocolate, then add eggs eggs one at a time, beating continuously. Add the flour and stir until just moistened; batter should pull away from the sides of the bowl. Pour batter into your prepared pan. Press peanut butter cups into the batter (three even rows of three). Bake 35 to 40 minutes, until a toothpick inserted in the centre comes out mostly clean. If in doubt, err on the side of under-baking these. 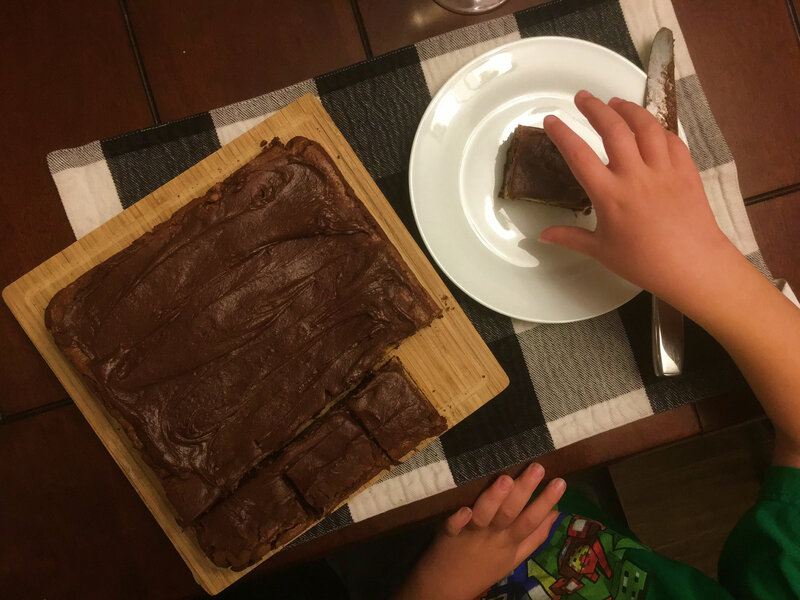 Let brownies rest in the pan 10 minutes before removing to a cooling rack. Let cool completely before frosting. Meanwhile, beat cream cheese, remaining butter, confectioner’s sugar, cocoa, and remaining vanilla until smooth and spreadable. Frost cooled brownies. A few months ago a very sweet student in one of the labs at work phoned his grandmother in Iran to get me a recipe, which he then translated from Farsi but maybe not very well. 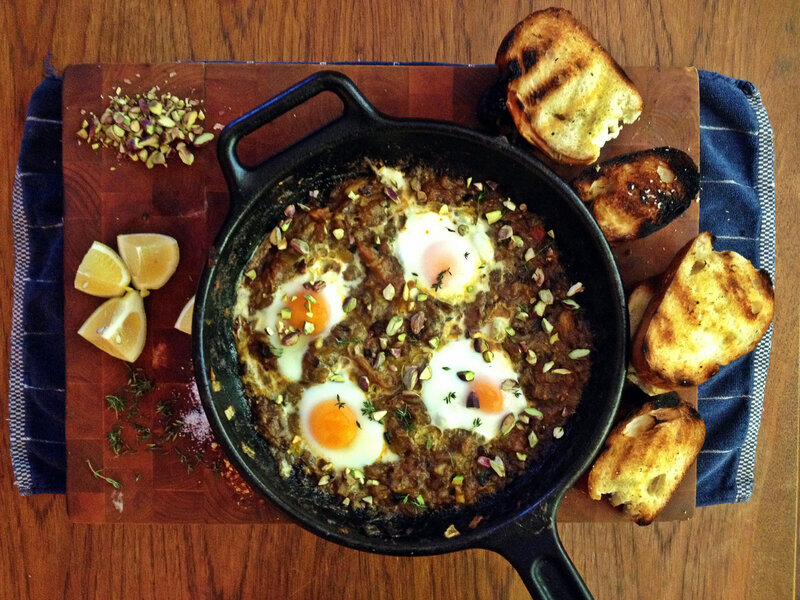 I knew he could cook, and I had wondered if he ever made mirza ghasemi, a dish of grilled eggplant and tomatoes mashed together with olive oil and spices and garlic and topped with fried egg. I had recently fallen in love with the dish at a Persian restaurant, but wasn’t sure exactly what was in it – there was no description on the restaurant menu, and sometimes Google lies. He knew it, but he didn’t make it, so he asked if I could wait a few days and then called home. It wasn’t eggplant season then, but it is now, so I pulled his recipe out of my inbox and realized there were a few things lost (or exaggerated) in translation – the ratio of eggs to eggplants was way off. A promising neuroscience student, he was hired away to Germany in the meantime so I can’t ask him my questions; this is a loose adaptation of his grandmother’s recipe, a dish from northern Iran that transforms bitter eggplant into a smoky dip for sangak or regular old white bread (toasted to within in an inch of its life for optimal sopping). The eggs make it a meal for two, or a hearty appetizer or snack for four. Heat oven (or grill) to 400°F. Using a fork or a toothpick, poke holes into eggplants and tomatoes all over. Drizzle one tablespoon of olive oil over whole eggplants and tomatoes. Roast or grill eggplants and tomatoes for 20 minutes, until charred in places and softened – eggplants should appear to slump. 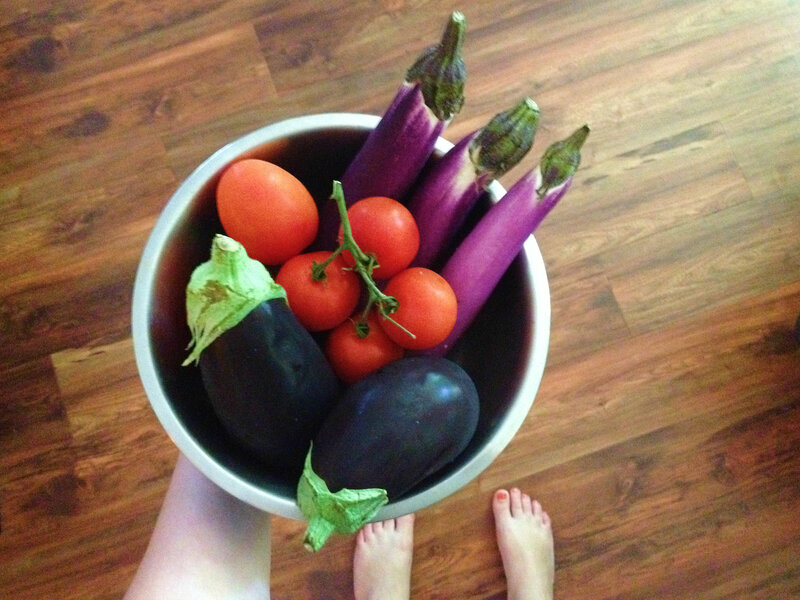 Remove eggplants and tomatoes to a glass bowl, and cover with plastic wrap. Cool for at least 15 minutes, or until you can handle them comfortably with bare hands. Eggplants and tomatoes can be roasted or grilled up to 24 hours in advance – just store in the fridge until you’re ready. If you roast your veggies ahead of time, return your grill or oven to 400°F before proceeding. Gently remove skins from tomatoes and eggplants. If you like a smooth puree, you can use a food mill to slough off the skins and stuff. I prefer to mash the veggies’ innards with a fork or potato masher until they form a chunky mush. Reserve any liquids that have accumulated at the bottom of the bowl you cooled your veggies in. Heat remaining olive oil in a 12″ skillet or cast iron pan over medium-high heat until shimmering. Add onion, and cook for about three minutes, until translucent but not browned. Add garlic, cumin, salt, paprika, turmeric, pepper, and pepper flakes, and cook for another minute, until the spices are fragrant. Add eggplant-tomato mush, and any remaining liquids, and simmer for about six minutes, until the liquid has evaporated and the mixture looks a bit dry and sticky, like it would burn to the bottom of the pan if you’d let it. Add lemon juice, stir, and taste. Adjust seasonings as needed. Using a spoon, create four little holes in the eggplant mixture, then crack an egg into each hole. Place the pan in the oven, and bake until the eggs have set to your liking, five to 10 minutes. Sprinkle the finished dish with fresh thyme leaves and chopped pistachios. I live in Vancouver, which is in Canada but not typically Canadian in many ways, the most disgraceful of which is our complete inability to function in the presence of even a tiny bit of snow. It doesn’t snow much here – some years, it doesn’t snow at all. 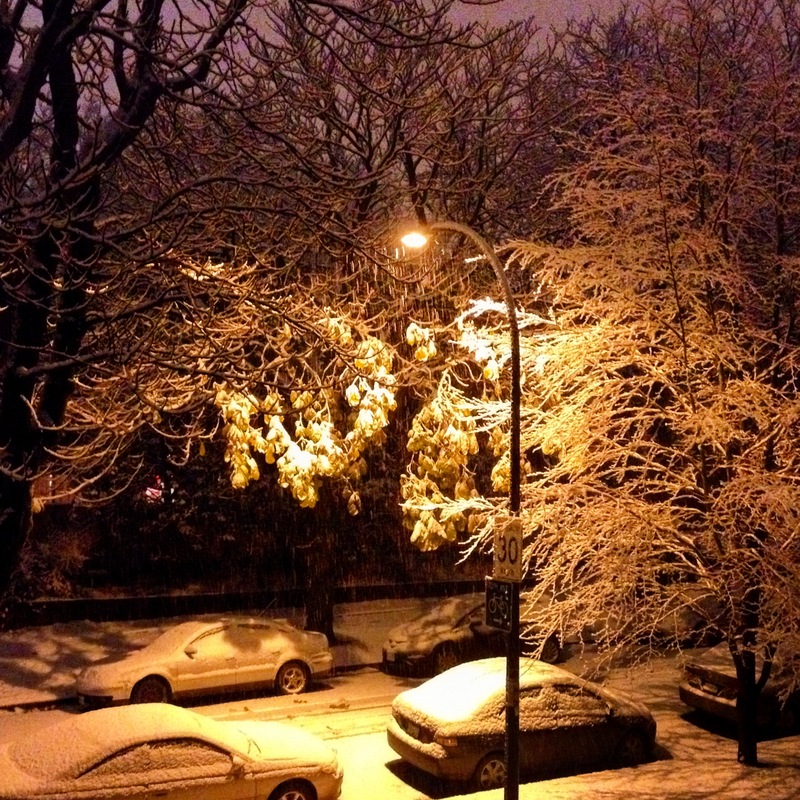 I can’t remember my last snowy Christmas. We do not have the infrastructure to support this kind of weather, and so a couple of centimeters of snow on the streets sends us into turmoil. It snowed today. I worked from home. We are planning our next adventure, and we’ve booked our flights – we’ll be in the Netherlands in late January. I am working on a new book, Dutch Feast, and it will be in bookstores and online in fall 2017, and the thing about Dutch food that is so lovely is that a lot of it is sugary carbs. And so even though it’s cold outside and my toes have yet to defrost from this morning’s failed attempt at finding a bus to work, I’m eating Dutch sweets and my home smells like speculaas spices. I mean, it’s an absolute disaster because recipe testing is messy and I’m usually remiss in cleaning up, but it smells nice and if I don’t look in the kitchen this whole scene is pretty cozy. 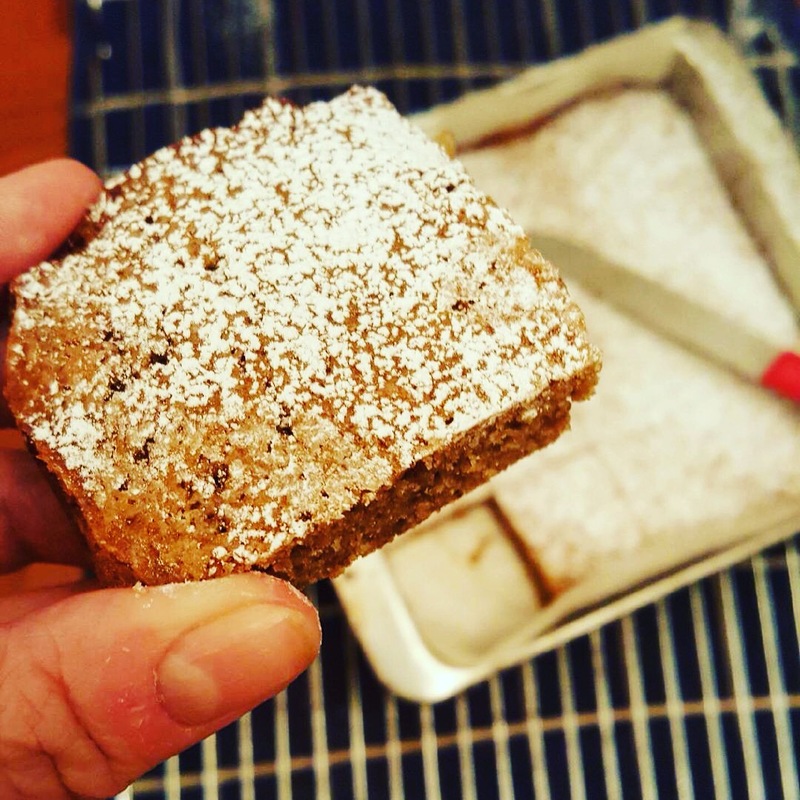 These speculaas blondies are an adaptation of a recipe in Heleen AM Halverhout’s Dutch Cooking (©1972); she suggests baking speculaas cookie dough “like brownies,” which she called speculaasjes. I like this idea quite a lot, because everyone knows brownies are better than cookies. We can debate this, but I’m not likely to entertain opposing viewpoints in this case. The nice thing about these speculaasjes is that they require no special equipment (no cutters or rolling pins required! 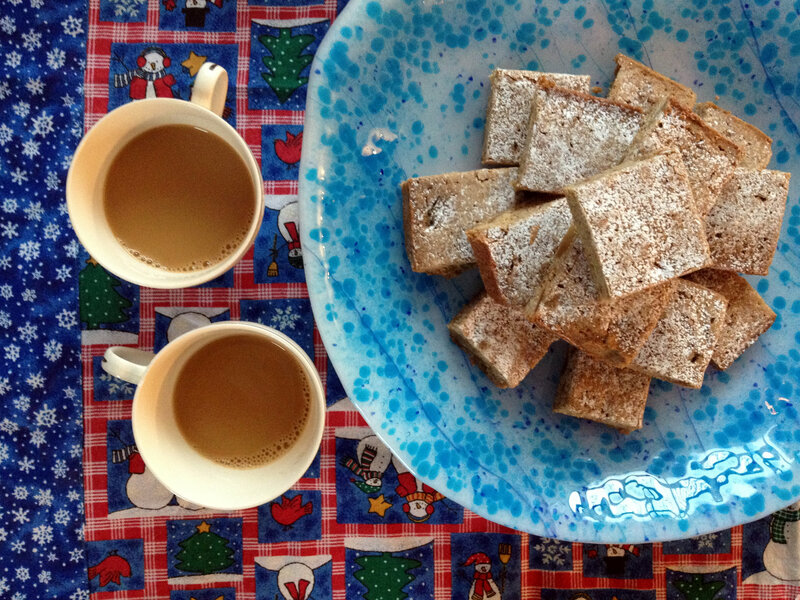 ), so if you start right now, you can have chewy, sweet speculaas blondies in time for this evening’s cup of tea. Preheat your oven to 325°F. Grease an 8″ x 8″ square baking pan and line the bottom with parchment paper. Cream together butter and sugar. Add the eggs, and beat until the mixture looks smooth. Add rum, cinnamon, nutmeg, ground ginger, cloves, and salt, and mix until combined. Gently fold flour into the spiced butter mixture until just moistened. Add chopped candied ginger, then spoon the mix into your prepared baking pan. Bake for 30 to 35 minutes, until a toothpick inserted into the centre comes out mostly clean (a few clingy crumbs = perfect). You want these just shy of totally baked, so that they are still chewy. Cool the blondies in the pan on a wire rack for five minutes, then turn them out onto the rack to cool completely. Once cool, sift confectioner’s sugar over top. Cut into sixteen pieces. Serve with tea or coffee and your feet in fuzzy socks or slippers. I've been bothering Swarni, my beloved office mom, for the recipe for her pork and cabbage curry FOREVER and she finally relented today. 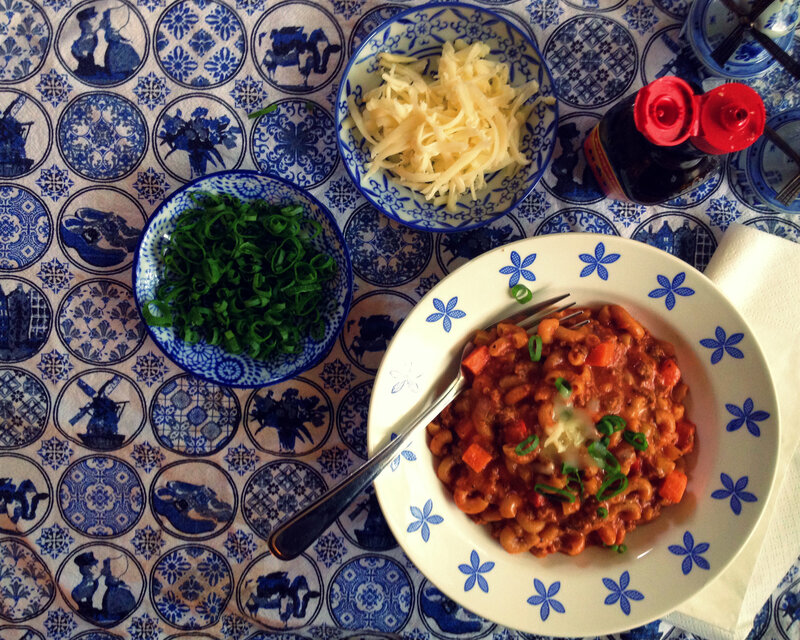 It is simple, flavourful, and cost almost nothing to make. I'm annoying, for sure, but she's given me no incentive to change. Yesterday was Guru Nanak’s birthday, which my friend Swarni told me about at work because she thought I’d like to take the kidlet and maybe Nick to visit a gurdwara, donate a dollar, and eat an Indian meal. This is a thing anyone can do, and Swarni says we can bring Tupperware for leftovers but the idea of being the greedy white lady with the Tupperwares mooching food from the Sikh temple kitchen is mortifying. She thinks I’m silly. It was a quiet day at the office, and so we took a couple of extra coffee breaks and Swarni talked about her late father, and about her faith, which is a weird thing to discuss at the office but if you can get over things being weird and just listen, you can learn stuff. Anything you can learn without Google will make you better, I think, and if not better then at least a little wiser. I want to learn everything, and am starting to understand how much less I have to talk to do that. And so we talked, and we ate most of a box of Toffifee that Seti brought in, and then Swarni finally shared her recipe for pork and cabbage, a thing I’ve been begging her for but which she repeatedly waved me off about. “Put it in your cookbook,” she said. It’s not much of anything, and that’s why it’s so amazing. It’s just a few simple ingredients, and they’re cheap, and it doesn’t cook long, it’s got a depth of flavour you don’t always get in easy weeknight dishes. This one’s a keeper. She said I could share the recipe with you. She says you can make it with chicken instead of pork, or with mushrooms and peas instead of cabbage, or with a can of puréed spinach. She says it’s best with bone-in pork chops, so you can pluck the bones out of the pot at the end of the meal for a nibble. I haven’t tried those other ways, but we do what Swarni says if we know what’s good for us. I made this with the intent to pack the leftovers for lunches, and there were no leftovers. The little one gobbled his up, and Nick had two big helpings. I served it with brown rice, but white rice will do just fine. I was going to make raita, but got lazy. A few slices of apple made a perfect accompaniment. Add butter, onion and salt to a Dutch oven or other heavy pot and sauté over medium-high heat until onions have just begun to soften, about two minutes. Add garlic and ginger, cook for another minute, then add tomato paste and curry powder. Add half a cup of water. Stir to combine. Add the pork to the pot, and stir to coat the pork in the spice-tomato mixture. Reduce heat to medium, cover the pot, and cook for 15 minutes. Remove the lid, and add the garam masala. Cook for an additional two minutes. Add the cabbage, stirring to coat in the sauce mixture until just wilted, another three or four minutes. You don’t want the cabbage to be limp and mushy – it should retain some of its toothiness and crunch. Sprinkle with a handful of chopped fresh cilantro, and serve over rice. It’s Thanksgiving tomorrow in Canada, which is as good a time as any for us to talk about cranberries. Though maybe it’s better to talk about empanadas, which are eternal and not bound to a single holiday or feast. Maybe the perfect Thanksgiving is a tropical one, because although today my body is here, in grey old Vancouver, covered in layers of Lycra-cotton blends and fuzzy fleece, my mind is somewhere else: under a palm tree, caftan-clad, and a little rum-drunk beside a plate of freshly fried sweet and savoury pastries. When you can’t reconcile where you are with where you want to be, the kitchen (and just the right amount of rum) can transport you. In Aruba, there was a bakery and if you got there early enough, you could buy still-warm pastechis filled with savoury bits of chicken or beef or pork. Pastechis are a Caribbean pastry filled with meats and cheeses, and we saw all types of them throughout our visit to the island; small, crisp pastechis filled with Gouda cheese with thin, crackly pastry like fried wontons, or bigger, chewier pastries reminiscent of empanadas, sweet and sort of like Pizza Pockets but not gross. The bakery was a bit inland, and we asked a lot of Google Maps in navigating us there (what we saved in buying pastries instead of restaurant meals we more than made up for in data and roaming charges), but it was worth it for those pastries which were so unlike anything we’d had before. I have since done a bit of research, and the difference between pastechis and Caribbean empanadas seems to be corn: pastechi dough is flour-based, and empanada dough uses cornmeal. Both are fried, which is wonderful. Even if I am wrong, either way you can’t lose. What follows is a recipe for empanadas, even though it’s inspired by the pastechis we ate in Aruba. I like the addition of cornmeal in these as it creates a chewier, sweeter exterior that works will with a tart, jammy filling. Using cranberries brings these home to cold climates and rainy weather and will certainly help take you where you need to go, even if only in your mind. In a small saucepan over medium-high heat, cook cranberries and persimmons with 1/2-cup of sugar until cranberries have burst and the mixture has become jammy, 10 to 12 minutes, stirring frequently. Set aside and let cool. Meanwhile, bring a pot with one cup of water and the milk plus three tablespoons of sugar to a boil over medium-high heat. Whisk cornmeal in and cook until thickened, one or two minutes. Add salt and nutmeg, then remove from heat. Gently fold one cup of flour into the cornmeal mixture until a dough forms. Cover and let rest ten minutes, or until cool enough to handle. Use the remaining flour (about a tablespoon at a time, as needed) to knead your dough for about three minutes, or until it’s no longer sticky. Divide your dough into eight equal pieces. Roll these into circles about five or six inches in diameter, or to about 1/4-inch thick. Place two to three tablespoons of filling in each, folding the dough over. Press the dough together gently, then seal by pressing the dough down around the fold with the tines of a fork. Heat oil in a Dutch oven or other sturdy pot to about 350°F. Working in batches, deep-fry empanadas, flipping once to cook both sides, until crisp and golden, about two minutes per side. Drain on a plate lined with paper towel, then serve hot. My friend Seti says that to “activate” saffron, you grind a little bit of it with a pinch of sugar, then steep it in hot water until the colour deepens. Then you can use the liquid whenever you make rice, or whatever you want to make taste like saffron. She brought me saffron back home with her from Iran, and this is the first saffron that has gone instantly yellow for me, like tiny droplets of yellow food colouring but fragrant. The Trader Joe’s stuff now seems like orange sawdust in a little jar, six dollars for nothing and I’ve got eighteen US dollars’ worth. It seemed like it was worth a lot more before I knew how well saffron could bloom, and how little of it you’d have to use if you used the good stuff. Everything is fine until you learn there’s something better. Maybe I should have ground the Trader Joe’s stuff down with a bit of sugar. I didn’t know how well that could work. We’ve finished our first full week of Kindergarten even though I am pretty sure this just happened, but what do I know? On the first day, that just-recently-a-baby and I stopped at Starbucks for hot chocolate on the way in, both of us chattering all the way about the things we’re looking forward to: reading books, writing books, fighting bad guys, flying on planes, and getting big enough for bigger adventures. I took this week off of work, partly because I wanted to concentrate on a bit of writing in a quiet apartment for once, but mostly because we have yet to sort out the details around Kindergarten drop-off and pick-up, and because the teachers ease the kids into school, gradually increasing the number of hours they’re in the classroom until they get to a full day, even the daycare kids for whom “full days” have always meant days longer than our work-days. “Gradual entry should be optional!” I exclaim to everyone but also no one in particular. I am talking to myself. So I’ve been walking two little boys to Kindergarten, mine and his friend who are a month apart in age and who is like a cousin or brother because they’ve been together, always for long days, since they were barely sentient. We cut through a park and on the way we stop at a pond and look at the ducks, and then they pick things up off the ground that I ask them not to, and then I shout at them for throwing things at the ducks. I listen to the other moms with their sweet, calm voices around their children who are surely as infuriating as mine is, as I think most children can be, and I practice their tones but when I do it, it always comes off a little condescending. In the yellow light that tints these fall mornings, both kids sort of glow, their fair hair almost ginger, the bright colours of their little boy clothes somehow over-saturated. I try not to talk too much. “Stop throwing crap at the ducks!” I have already come down with a cold. To make saffron milk, take a pinch of saffron, just what you can grab with the tips of your thumb and forefinger, and grind it into your palm with the thumb of your other hand until the strands crumble into little pieces. Good saffron has a smell a little bit like sweet pepper, and reminds me a bit of anise, not because of its fragrance but because of the way both are sweet and bitter at the same time. Saffron milk is an old-fashioned Dutch cold remedy, though the Dutch had trading posts in India for over 200 years so it’s likely that merchants there were influenced by Ayurveda and the medicinal use of saffron milk to improve sleep, reduce inflammation, and to strengthen the baby’s heart during pregnancy. Dutch mothers are said to be patient people. I like the idea that someone has figured out parenting and is doing it right, somewhere. It makes me feel like anyone could do it. Add your bits of saffron to a saucepan with a cup and a half or so of milk, and about a teaspoon of honey. Natural health proponents suggest drinking warm milk and honey as a sleep aid, as both are sources of tryptophan. What science says about this is kind of a downer, of course, but there is something soothing about a warm mug in your hands nevertheless. Bring the milk to a boil over medium heat, whisking quickly for maximum frothiness. Remove the pot from the heat, and pour the whole thing into a mug or two teacups. It makes about twelve ounces, or the amount of a tall Starbucks latte. This is enough for one or two people. 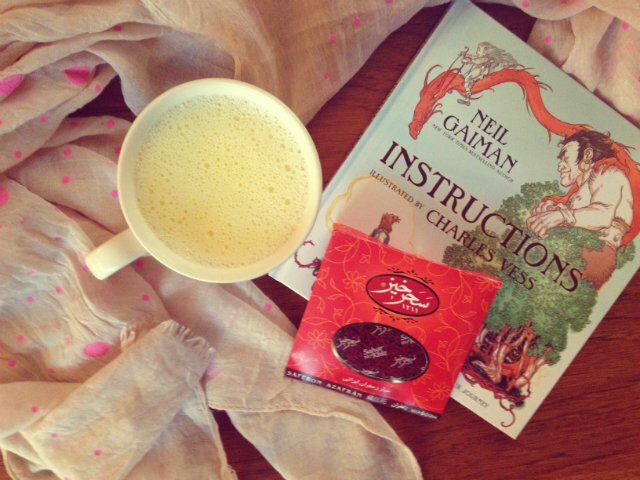 When you sip your saffron milk, do so with your eyes closed. Think about little golden boys, and the way they shine now, the way they are like sunflowers stretching toward the yellow morning light. Do not think about those blue shadows stretching out behind them, where you stand, fretting, worrying about the time. They call out to the ducks, and the ducks swim away faster as their voices rise to be heard. “Come on, boys. We have to go,” you say. And you hurry them along.